community action instead of crime. The overall benefit is that this decreases the demand on Ipswich police and sets the young people on a positive path in their community. What was the issue/challenge being addressed? The target audience is young people who fit into the category of NEETS, at risk of offending and/or from a lower socio economic group. NEETS and at risk of offending is defined as young people who are not in education or employment. This can also include social background factors such as poor education, low socioeconomic status, location, prior offences/background, poor employment within family. Young people can refer themselves to the satellite club or people can refer family members or friends. Local organisations, agencies, colleges and schools can also refer their young people to the Satellite Club or the young people can simply turn up and join in. Inactivity is correlated to lower socio- economic group which is why this is an important population to work with. This is especially prominent in Ipswich as Suffolk's index of multiple deprivation (IMD data) shows that Ipswich is one of the highest levels of deprivation in Suffolk. Furthermore, the average earnings of Ipswich's residents are significantly below the regional and national averages. Just 30.6% of Ipswich's population are qualified at Level 4 or above, compared with 34.8% across the Eastern region. Working with young people who are at risking of offending is especially important as in November 2017 police in Ipswich were tackling approximately 89 violent crimes a week, which equates to 12 incidents a day. There was a further 76.9 thefts a week, 11 per a day. This satellite club acts as early intervention, to ensure that the young people are prevented from engaging in these activities in the future. Over the Summer young people are not in educational settings and it is a yearly trend that anti-social behaviour increases during these times, shown in the graph above. This provides the rationale for providing funding for 50 weeks a year, to ensure that the young people are occupied over the summer months when they are more at susceptible to these activities. There are a high number of gang related incidents in Ipswich. Being part of a gang makes young people more at risk of committing crimes, dealing or taking drugs, ending in prison and/or being a victim of violence and even death. Despite the crackdown on London based dealers targeting the area, organised crime groups are still prominent in Ipswich and target vulnerable people (including children) to distribute Class A drugs. They use violence, treats, and coercion to exert control over youngsters who are usually known to care services. It is the Satellite Club aim to prevent participants becoming involved with the Ipswich Gangs. What action was taken to overcome the issue/challenge? There were a variety of challenges that the Satellite Club has looked to address to reduce possible barriers that the young people may face. In previous projects that Suffolk Family Focus have supported they drove young people to sessions as these were areas that were hard to reach by walking and/or cycling. From this we decided to have the Satellite Club in a central location that was easily accessible for the young people we are targeting. Another barrier to our target group taking part in physical activity and/or sport is financial issues. The Satellite Club is offered for free to all young people, with the aim of making it sustainable through upskilling the older age group to deliver the session after the funding has finished rather than charging a session fee. The Satellite Club is linked to the boxing club and is based on their premises. 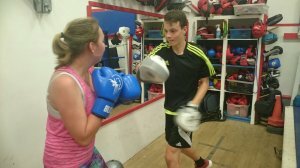 This allows participants to have a real experience of what it is like to be part on a boxing club and allows them to move into the club once they reach 20 or want to pursue boxing further. The club has recently become evicted from their premises and have had to relocate. 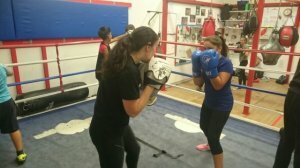 The boxing Satellite Club has moved to the same venue as the club to continue the club linkage and provide a pathway for the young people to progress onto. Suffolk Sport has supported the boxing club throughout the move to ensure that they have a venue to continue the Satellite Club and the personal progress is not stopped. What was the impact on the young people and/or partners involved? The impact on the wider community is that this has contributed to a 37% drop in anti-social behaviour in 2017. The free weekly sessions continue to attract large numbers of 14-19 year olds and offer a positive alternative to anti-social behaviour and other crime related incidents. Tim Passmore, Suffolk's Police and Crime Commissioner comments that he had seen first-hand the positive impact the session has had on the reduction in anti-social behaviour. Furthermore, Tim Passmore commented that by showing young people how to make positive life choices they become good citizens and giving them positive role models will help them to become more confident and principled adults. Working with Suffolk Family Focus has allowed the organisation to refer the young people they work with on a daily basis. Suffolk Family Focus help to break down barriers the young people may face by providing support and encouragement to attend the sessions. This has been shown to be beneficial if the young person begins to stop attending the sessions. Through our surveying we have been able to see the positive impact the Satellite Club has on the young people in a short period of time. Participant 1 has been attending for 3 months and his mental well-being based on the Warwick Edinburgh scale has increased from moderate to a high wellbeing score. Since starting his physical activity levels have also increased from 30 - 149 minutes to 150+ minutes. Similar results have been found in participant 2 whose mental wellbeing scores have gone from low to moderate in a 3 month period and physical activity levels have increased 30 - 149 minutes to 150+ Minutes. These positive results have been shown across a number of individuals with 54.55% of young people now doing 150+ minutes of physical activity in comparison to 27.27% when they started. We will continue to track the young people as they continue to attend the session over the upcoming year. Martin runs the Ipswich Boxing Club who hosts the Boxing Satellite Club. Ipswich Boxing club have created a direct link from the casual Satellite Club session into the more structure clubs session for those who wish to progress their boxing on. Martin states "At Ipswich Boxing Club we have seen at least 8 people cross over from the Satellite Club classes to join Ipswich Boxing club in the past year. The impact on our young attendees can be seen in as little as 8 weeks with a difference in their demeanour and a clear improvement in their confidence which has been witnessed away from the gym as well as in the gym". There have also been 3 young people join one of the coaches Fump Fit sessions in addition to their involvement at the Satellite Club session. This means that 11 young people have taken up the sport on a more serious and competitive basis. The coaches discuss with the attendees what makes them want to attend and the coaches rarely get told that they want to be a boxer. Usually the motivation is to combat self-esteem or weight issues, due to being bullied and sometimes due to peer pressure. Sometimes faced with the lack of financial support the sessions offer young people free opportunities to take part in the activity. Martin states that "Working with youngsters at the Satellite Club has influenced me to become a mentor with Catch 22, this in turn boosted my exposure to disadvantaged people. As a result I have attended a counselling course, started a mentor regime at my employers and instil a "don't walk by" attitude at our boxing club. We have regular group meetings and discussion and share concerns. We have highlighted concerns for one of our boxers to NSPCC and we have enquired as to the movements of attendees who have exhibited personal issues and have not been seen at the club for some time and attempt to bring them back to the gym or at least check on their status". What are the next steps for this satellite club/approach? in the club to wanting to give something back to the project by volunteering. The roles the volunteers will play include supporting the head coach to deliver activities to young people, record-keeping, and general engagement and relationship building with young people at the sessions.